Super Rock. Future Rock. Someday Never Rock. Every climber who's walked underneath the boulder has eyed the obvious, yet rectal-clenching problems that seem possible, but not very probable. The imposing west face and jagged arête of the overhang offers some interesting holds and features that lure the climber further and further left onto the dramatic arête and out over the busy road beneath. Seriously? Yeah. Seriously. This Roadside Horror Show has deep, seeping cracks with moss sprouting out and geological-looking tags and some rusting hardware that appears to have been installed to make sure the giant, broken overhang holds together. 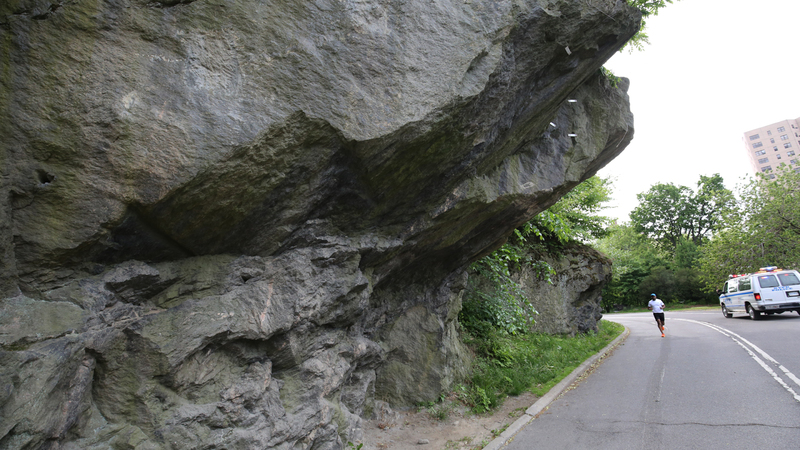 It also offers potential 15 - 25 foot falls onto a road populated with huffing runners and streaking bicyclists. And cars. Even without crash pads, there were a few crazed locals back in the late 80s who couldn't keep their hands off of any decent-looking piece of rock. There were a few tentative attempts at climbing the west face of Roadside -- oddly staying to the right side where a landing spot was non-existent -- and up to the dark, lichen-covered bulge of a project dubbed Roadkill. But even with some pre-inspection and cleaning from the top, none would find the nerve to make the moves over the water-streaked bulge. 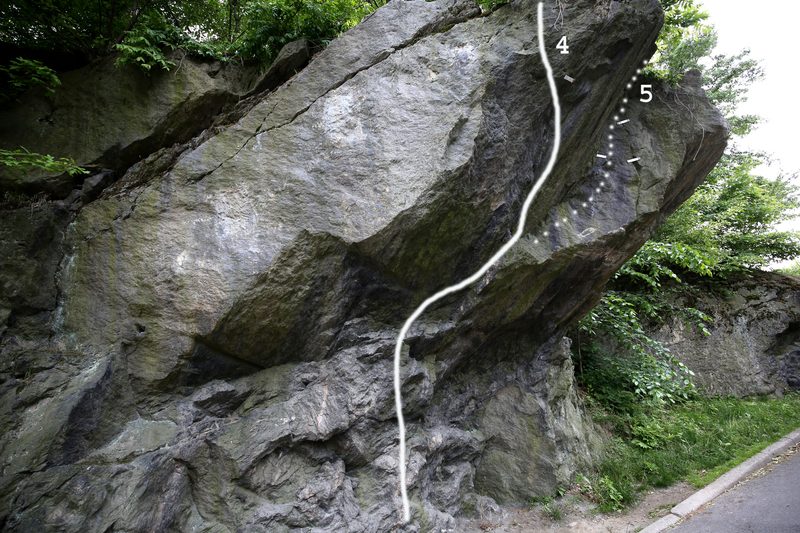 Eventually, the New Age of Bouldering in the mid-90s swept into New Paltz (and by extension New York City) creating a new generation of standards-pushing problems. 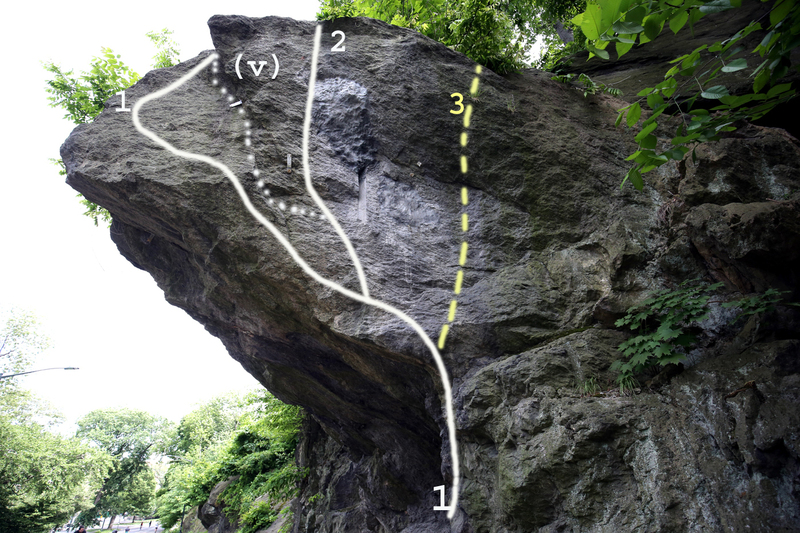 Climbers who had found ways to exploit the Gunks-area bouldering despite the numerous horrible landings made visits to the Someday Never rock and brought the same solutions: crash pads and multiple spotters. This approach made the idea of climbing the overhanging left side of the west face far more appealing in terms of quality and safety. Beware. Even with multiple crash pads and spotters, the height and location of Roadside still presents considerable risks to the climber. Picking the right day of the week and the right time of day are critical for attempting the problems at Roadside. 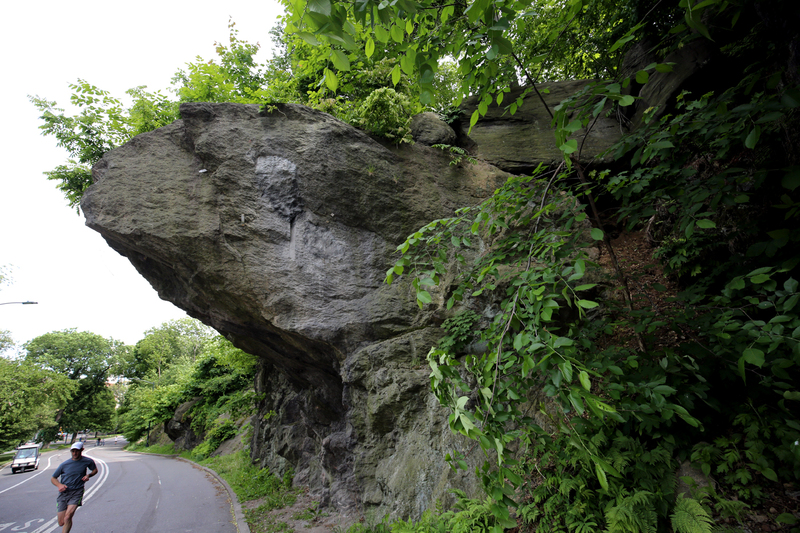 When you're ready, you'll easily find the boulder sitting along Central Park Drive at the far northern end of the park near 109th - 110th Street. *Pre-inspection of the top-outs for all of these problems should be considered mandatory. Start: Below the middle of the West Face of Roadside Boulder. Climb: Up until you establish your feet on the obvious ledge. Move left and up using side-pulls, following the lip of the big overhang out left and the wild finish on the final slab. First Probable Ascent - Ivan Greene. Start: Same as The World Is Not Enough. Climb: Up past the same ledge, but head up in between the large side-pulls on the left and the blast hole on the right. Top out. Variation: The Eiger V6 R/X Trend slightly more to the left following the large side-pull flakes and the slab -- ignoring the Blast Hole. Climb: Up to the ledge, and then move right up to the dark water-streaked face beneath a bulge. Over the bulge to the top (crux). *A fall from the bulge will have serious consequences. Start: Stand under the giant 'V' shaped cleft in the middle of the large overhang. Step left a couple feet. Climb: Up the short wall and move right toward the ledge via pinch hold. Continue right to the obvious large seam that breaks the left side of the 'V' cleft and gain a right-facing edge -- then up the crack -- using edges on the blank-looking left wall. As the crack narrows near the top, move left to holds that allow you to climb over the lip of the overhang to a wild top-out. *If this problem wasn't over a road, it would get far more attempts. Still needs an ascent with a photographer in the right position to truly capture the awesomeness of the problem. Probable First Ascent - Ivan Greene. Start: Same as for Wild Style. Climb: Use the same beginning as Wild Style, but traverse right past the large seam/crack and continue up the overhanging, diagonal corner. Hang on. That ambulance might come in handy.